OpenStack Docs: Welcome to Monasca’s Documentation! 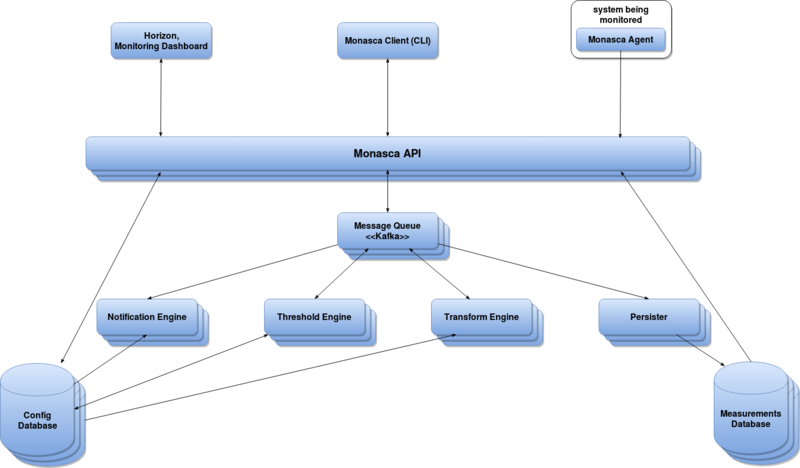 The following illustration provides an overview of Monasca’s metrics pipeline and the interaction of the involved components. For information on Monasca’s log pipeline, refer to this wiki page. monasca-api: RESTful API for metrics, alarms, and notifications. monasca-agent: Agent for retrieving metrics data. monasca-persister: Writes metrics and alarm state transitions to a time-series database. monasca-thresh: Thresholding engine for computing thresholds on metrics and determining alarm states. monasca-notification: Pluggable notification engine for consuming alarm state transitions and sending notifications for alarms. monasca-transform: Aggregation engine based on Apache Spark. Monasca Client: CLI and Python client. Horizon plugin: Plugin adding the monitoring panel to Horizon. Grafana app: Plugin for Grafana to view and configure alarm definitions, alarms, and notifications. monasca-common: Common code used in the Monasca components. monasca-statsd: StatsD-compatible library for sending metrics from instrumented applications. monasca-grafana-datasource: Multi-tenant Monasca data source for Grafana. grafana: Forked version of Grafana 4.1.2 with Keystone authentication added.